Jeffrey Welch's Blog: Let’s Talk Dog Cloning — Would You Ever Clone Your Dog? Let’s Talk Dog Cloning — Would You Ever Clone Your Dog? We’ve all had that special dog. The one you just couldn’t bear the thought of saying goodbye to. What if you didn’t have to? You might recall Dolly the sheep — the first successfully cloned mammal. It’s been 20 years since Dolly made her debut, and cloning has come a long way. South Korean researchers started dog cloning in 2005, but at $100,000 a pop, such services were out of most pet owners’ reach. Enter ViaGen, a Cedar Park, Texas-based livestock cloning company. In 2015, ViaGen started cloning pets in the states. Less than a year later, the first U.S. cloned dog was born: a Jack Russell Terrier puppy. ViaGen slashed the price of a cloned puppy in half — just $50,000 for dogs. A cloned cat is even cheaper: $25,000 (as it turns out, cats are easier to clone than dogs, so it’s less expensive). It’s still pretty pricey, but some people are doing it. The question is, why? “The common thread here is that love for their pets,” says Melain Rodriguez, client service manager for ViaGen. “They share an extreme love and bond with the pet. It’s something that can give a client hope, especially if a pet is ill or very recently deceased, it can give a little bit of hope for the future that there’s a little piece of them still growing and living.” ViaGen also offers a genetic banking service similar to cord blood banking for human babies, a hot trend among new parents. The initial genetic preservation costs $1,600, and there’s an annual storage fee of $150 per year, which begins after the first year. Pet owners can then decide to clone their pet later or just keep storing the cells indefinitely. Jack Russell Terrier Nubia was the first puppy cloned in the United States. Photography Courtesy of ViaGen. Basically, there are no guarantees when it comes to a cloned pet’s personality. “The feedback from our clients tells us that personality and temperament are very similar in the cloned animals,” Rodriguez says. “I wish we could say for sure yes, they are going to have exactly the same personality, but it can really depend on environmental factors as well as some genetic factors.” A cloned dog might not even look identical to the original dog. “One thing that can change in a cloned animal is the patterning of the fur,” Rodriguez says. “If the original dog is a black dog with white spots, then the cloned puppy will be black with white spots, but those white spots can be in a different location. That’s something that is determined by an external factor: the uterine environment.” However, the ratio of black to white will likely be similar, and the puppy will most likely have a similar body shape, size and conformation as the original dog. Now that cloning is no longer relegated to livestock or eccentric billionaires, the odds of meeting someone with a cloned pet are going up. But just because you can do something doesn’t mean you should. With so many homeless pets sitting in shelters, isn’t all this cloning stuff just a little bit too crazy? Maybe not. Cloning is not only used for special pets. “We’ve had some therapy dogs that are going to be cloned, working dogs, like drug-sniffing and bomb-sniffing dogs,” Rodriguez says. Working dogs and service dogs are typically spayed or neutered young. But an outstanding dog’s genes are valuable. Cloning offers a way to use those genes for future generations. Animal conservation is another area where cloning can be of good use. ViaGen is involved in cloning two endangered species related to cows: the gaur and the banteng. How does dog cloning work exactly? 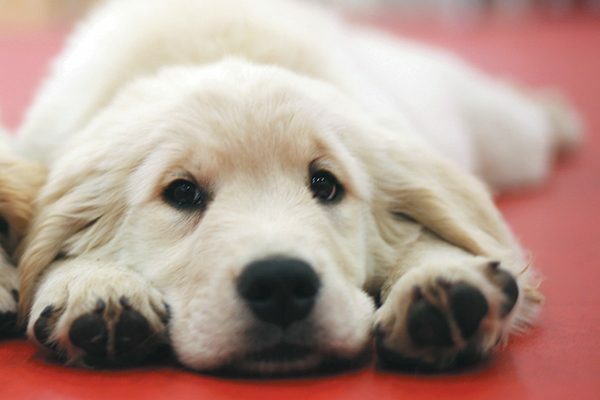 A Golden Retriever puppy relaxing on the floor. Photography ©appleping | Thinkstock. Now that you know a dog can be cloned, just how do they do it? The first step is collecting and preserving genetic material from the dog who will be cloned. Using a kit from ViaGen, a veterinarian collects a few tiny pieces of skin via a process called a punch biopsy. The vet uses a local or general anesthesia so the dog feels no pain. The cloned embryo is then transferred into a surrogate dog, much the same way a human can use a surrogate to carry a baby if the mother is unable to sustain a pregnancy. ViaGen transfers several cloned embryos at the same time to increase the odds of ending up with a live puppy. “Because we do transfer more than one embryo into the surrogate there is potential more than one puppy could be born, but every puppy born in that litter will be a genetic twin to the original dog,” Rodriguez says. In addition to taking home one or more cloned puppies, the client has the option of adopting the surrogate dog who carried and gave birth to the puppies. If they decline, the surrogate dog will either be used again within the cloning program or adopted to a different family. Thumbnail: Photography ©Folsome | Thinkstock. Jackie Brown is a freelance writer, editor and pet-industry consultant. She lives in sunny Southern California with her Miniature Poodle Jäger. Reach her at jackiebrownwriter.wordpress.com. The post Let’s Talk Dog Cloning — Would You Ever Clone Your Dog? appeared first on Dogster.